who more-or-less dabbled in private detection. In between, it starred an intrepid news photographer. But when it began, the star was a comical Native American so stereotyped, no newspaper in America would touch it today. In 1936, Publishers Syndicate (which, among other things, later launched Nicholas Dallis's three soap opera strips, Rex Morgan, Judge Parker and Apartment 3-G) approached cartoonist Elmer Woggon (whose earlier strip, Skylark, is sometimes credited as the first aviation adventure strip, tho that distinction actually belongs to Tailspin Tommy) to create a strip based on a W.C. Fields type. Woggon brought in the drama critic for The Toledo News-Bee, Allen Saunders (whose later strips include Kerry Drake and Mary Worth) to write the scripts. Together, they created The Great Gusto, who was originally supposed to be the titular star of the strip, but was demoted before it even saw print. Like most fictional purveyors of patent medicine, Gusto traveled with an Indian to help him separate the marks from their money. But Big Chief Wahoo didn't really need the employment. Oil had been discovered on his land, so as far as he was concerned, he and Gusto were merely traveling together. He'd left his village of Tepee Town to go to New York, so he could look up his old girlfriend, Minnie Ha-Cha. 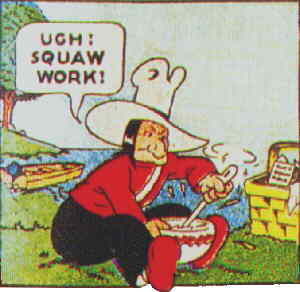 The original idea may have been for Gusto to get a new partner when Wahoo achieved his goal, but the Indian had become the star, so when the time came, The Great Gusto was the one who dropped out of sight. Unlike a lot of wealthy comics characters, such as Steve Canyon's Copper Calhoun, Abbie & Slats's Jasper Hagstone and even, on occasion, Uncle Scrooge, Big Chief Wahoo was purely a good guy. Much of the humor came from schemers trying to cheat him out of his money, and him foiling them even while never quite comprehending what they were up to. But his failure to understand wasn't a result of stupidity, as it may have appeared on the surface. Like many truly good-hearted people, Wahoo simply had trouble grasping the fact that anyone else wasn't. Wahoo was soon reunited with Minnie, working in a Manhattan night club. The storyline, full of puns and other types of broad humor, then revolved around show biz, first in New York and later in Hollywood, where Wahoo's stereotyped patois fit right in. Eventually, they got back to Tepee Town, where he'd started. These stories appeared not just in the newspapers, but also in three Big Little Books from Whitman and seven comic books from Eastern Color Printing (publisher of Famous Funnies, the first comic book in the modern format). Meanwhile, the storylines had gradually been growing more serious. In 1940, Wahoo hooked up with a photo-journalist named Steve Roper, who became more and more prominent a cast member. He even had a romantic fling with Minnie! During World War II, Roper fought spies and saboteurs, with Wahoo as a mere sidekick. As comedy was de-emphasized, Woggon's cartoony art style began to seem less appropriate. His byline remained until 1947, but the actual art was being handled by ghosts, first (when it was still pretty cartoony) his brother Bill (creator of Archie Comics' Katy Keene), later Don Dean (creator of Cranberry Boggs, which was sort of like Li'l Abner transplanted to a seacoast) and still later Pete Hoffman (who is better known for Jeff Cobb<). In 1944, Roper started sharing the title of the strip — and was soon getting top billing. Wahoo's role continued to shrink, to the point where he eventually stopped appearing at all — he was last seen on Feb. 27, 1947. Steve Roper then took over the entire strip, including the title — which, years later, he began sharing with an adventurer named Mike Nomad. Under the name Steve Roper & Mike Nomad, the strip kept coming out for the rest of the century, distributed by King Features Syndicate (which finally dropped it December 26, 2004). To look at it in its later days, you'd never guess it was once a gag vehicle for a W.C. Fields look-alike and a naive Native American millionaire. Text ©2003-09 Donald D. Markstein. Art © Publishers Syndicate.